Hey everyone, it’s Claire here from The Kitchy Kitchen. My mum is a proper Aussie, meaning, she raised me on pavlova and regret-drenched love ballads sung by the torchiest torch light singers of the ‘60s. And Abba. Australians looooooove Abba. But back to Pavlova and my mum. My mum baked a lot of fabulous things when I was growing up. Every day after school, I’d rush through the door to see what she had made. What I remember most about her kitchen was the music. She’s the most musical person I know. Dance parties to the B52s was a common occurrence, drumming on the kitchen island with wooden spoons and teaching each other dance moves. Not much has changed, really. I begrudgingly join the dance parties that she always kicks into gear after a birthday or Thanksgiving, but by song number two I’m in with both feet, doing my best to not look like a total dork. Pavlova is one of the special desserts for me. 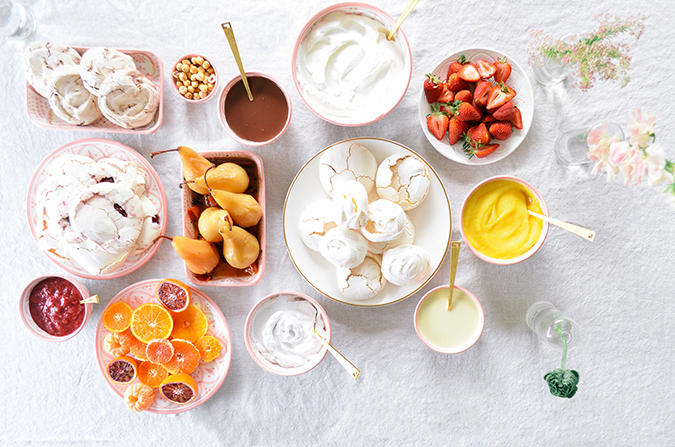 My mum gave in to our every whim when it came to the birthday cake conversation: baked Alaska one year, a three-tiered wedding cake for my sister the next, but pavlova would always pop up around my birthday because it was the quintessential summer dessert. 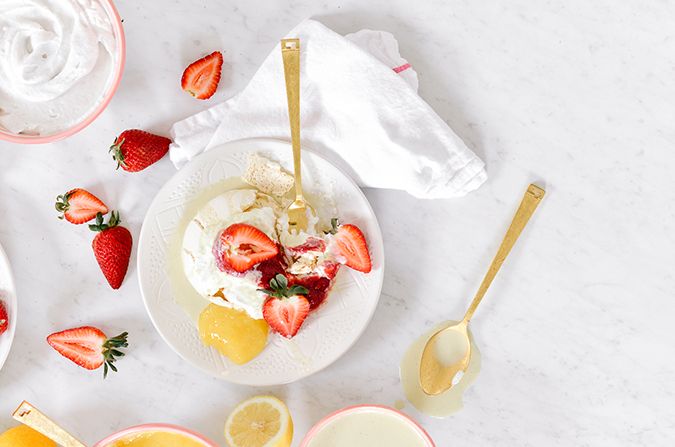 Light, sweet, and airy, just like the ballerina whose tutu it was named after. 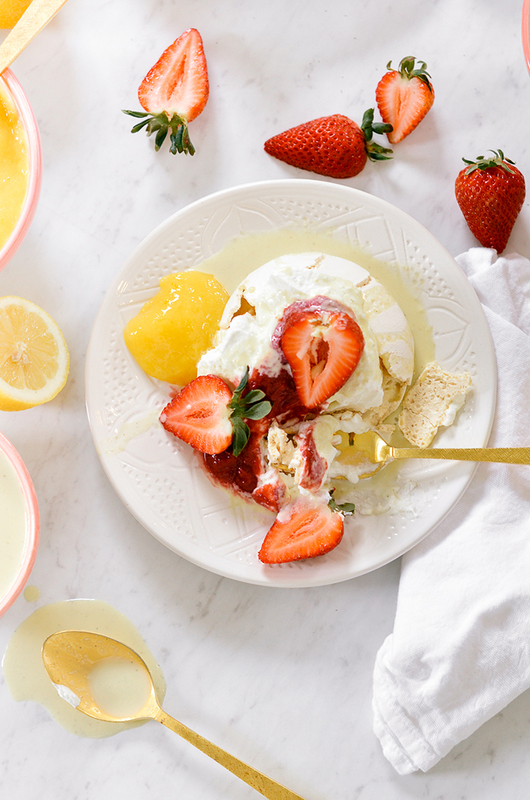 So today I’m sharing her pavlova recipes, with several ways to add some of your favorite flavors. You can whip up a batch of traditional vanilla pavlova or try your hand at the blackberry Grand Marnier or chocolate hazelnut. From there, have at it drizzling chocolate sauce, crème anglaise, lemon curd or strawberry rhubarb sauce on top. 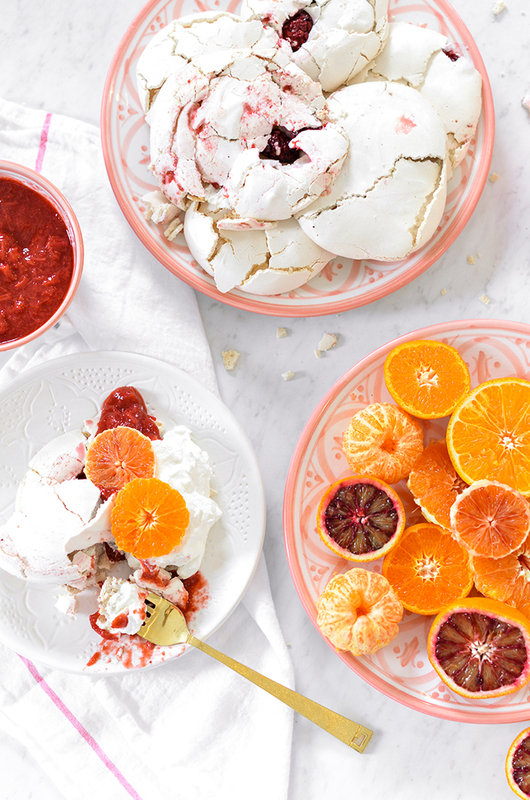 Pile on some macerated citrus or poached pears and you have yourself a gorgeous and delicious spread perfect for a Sunday morning Mother’s Day brunch. 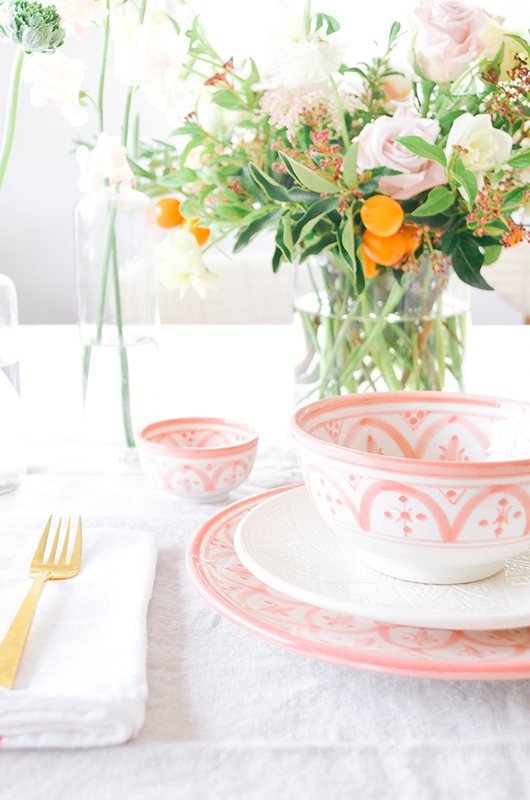 No matter how what topping you choose, be sure to serve them on The Little Market’s gorgeous blush Moroccan ceramics just as we did here. Enjoy! 2. Sift the sugar and cornstarch. 3. On low, mix the whites and salt for 1-2 minutes, or until frothy. 4. Go up to medium high, gently adding in the dry ingredients. 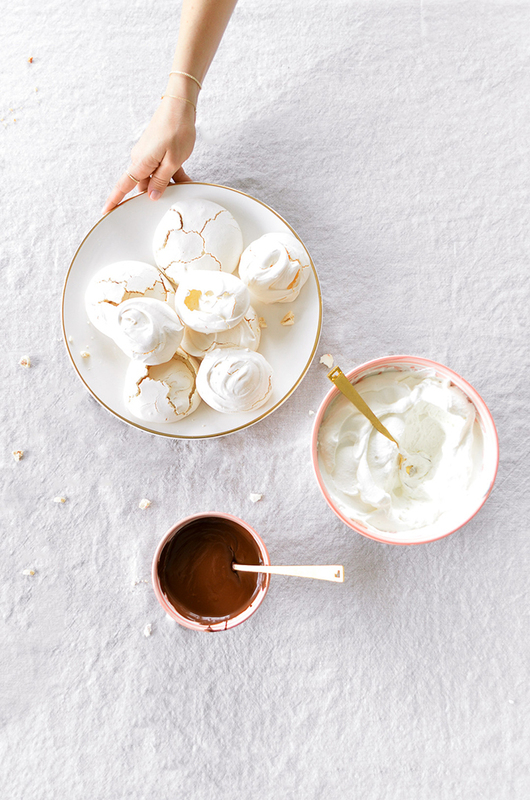 Once the meringue is glossy and forming soft peaks (anywhere from 4-10 minutes, depending on your mixer), finish on high speed and add the scraped vanilla. If doing mix-ins add now. 5. Spoon the meringue onto a piece of parchment paper, it should be anywhere from 1-3 inches high and about 3 inches wide. 6. Pop in the oven and bake for 50-60 minutes for small pavlovas, and 80-90 minutes for large pavlova. It should be a slight beigy-pink and definitely NOT toasted. 7. Turn off the heat and crack the oven open. Let the pavlovas cool to room temperature and remove (this is to prevent cracks and to cook it totally through). You want it crisp on the outside and soft on the inside. Combine everything in a small pot over medium heat, cooking for about 5 minutes, or until the berries get juicy. Take off heat to cool completely. Gently fold into the finished meringue. Add all ingredients to the meringue and gently fold to combine. It shouldn’t be thoroughly mixed, so just fold a few times. 1. Place chocolate and salt in a medium heatproof bowl. 2. Heat cream in a small saucepan just until steaming (do not bring to a boil) and pour over chocolate. 3. Let sit until chocolate is melted, about 5 minutes. 4. Add butter and whisk until butter is melted and incorporated and mixture is smooth. Serve warm. 1. Over medium-high heat, combine lavender, milk, cream, 1/4 cup sugar, and vanilla. Bring mixture to boil. 2. Whisk egg yolks and remaining 1/4 cup sugar in medium bowl. 3. Gradually whisk in hot milk mixture. Return mixture to same saucepan. 4. Stir over medium-low heat until custard thickens and leaves path on back of spoon when finger is drawn across, stirring constantly, about 2 minutes (do not boil). 5. Cover and chill until cold, about 3 hours. 1. Combine yolks, lemon zest, lemon juice, and sugar in a small saucepan. Whisk to combine. Set over medium heat, and stir constantly with a wooden spoon, making sure to stir sides and bottom of pan. Cook until mixture is thick enough to coat back of wooden spoon, 3 to 5 minutes. Remove saucepan from heat. Add butter, one piece at a time, stirring with the wooden spoon until consistency is smooth. 2. Transfer mixture to a medium bowl. Lay a sheet of plastic wrap directly on the surface of the curd to avoid a skin from forming; wrap tightly. Let cool; refrigerate until firm and chilled, at least 1 hour. And there you have it! 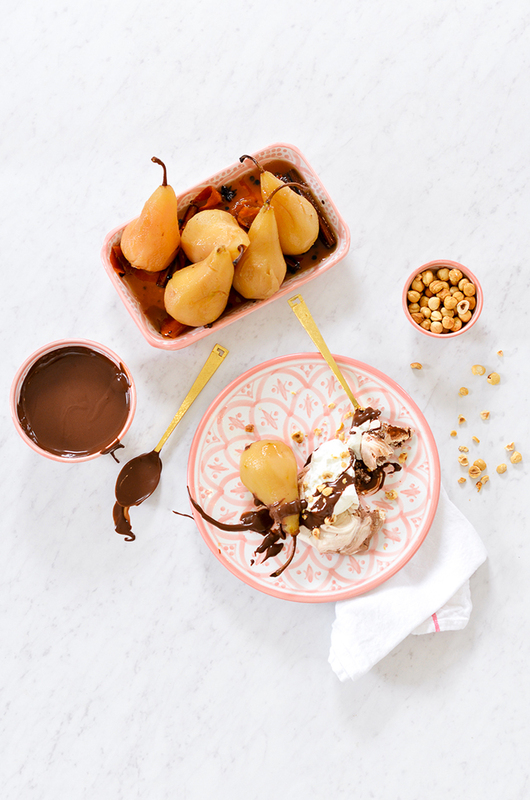 One of our very favorite things about this recipe—besides the delicious flavors, of course—is how gorgeous it looks plated on The Little Market’s new blush Moroccan ceramics. Click here to shop the collection. How will you be celebrating your mom this year?